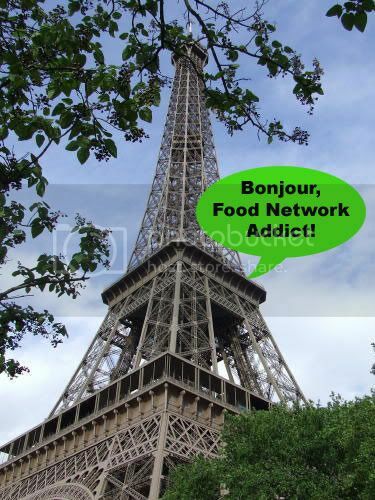 food network addict: Taking Off to Paris & London - Be Back Soon! Taking Off to Paris & London - Be Back Soon! I have been going crazy trying to finish all my last-minute packing, getting addresses and maps ready for the restaurants I want to go to (thanks for all your great suggestions), and making sure I haven't forgotten anything before I take off for a week to go to Paris and London. I realize that a week is not nearly enough time to see even a bit of all there is to see in both of these amazing cities, but since it's my first time visiting them I hope to get a good general overview and remember the places I'd like to spend more time at in the future. I have a few posts already lined up, and I hope to have a few guests posting some things next week. I'll post pics and update as much as I can. Until then, have a great weekend and week everyone! I'll write a guest post for you Jake. I am surprised you didn't ask me. I'd drop everything in a nanosecond to help you out. Have a good trip! Next year, you ought to go to Greece :) It's BEAUTIFUL! And Alec: I knew you wouldn't let me down, man! What would you even want to write about? Well Jake, for starters I could do a 101 on TV broadcasting with a food angle. Or I could do a blog post on " Reality TV & Food, Where does it End and Why did it happen? Say do think you might make some time to visit the site of Princess Giada's culinary training ? Anyone can go. Tell em you want to take the weekend "Continental Breakfast and Mascarpone Cheese tasting course" and tell em you once had a phone interview with her. They will probably say "Giada who "? Tell them you're a journalist working for Gourmet or Bon Apetit. Is Ina going to be on the Continent when you are there ? Would n't that be gas uh ? Have fun Jacob, enjoy the trip! Jacob has posted some FN shows that have been picked up. Is there anyone out there that knows which shows have been cancelled? Thanks alot if you have the info.